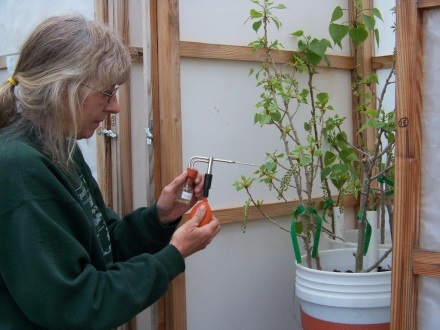 Spring is a busy time for breeding hybrid poplar for improved biomass production. GreenWood Resources’ (GWR), which leads the AHB Feedstock team, is researching ways to improve the biomass yields of hybrid poplar for biofuels and biochemicals at their Westport, Oregon Tree Improvement Center. 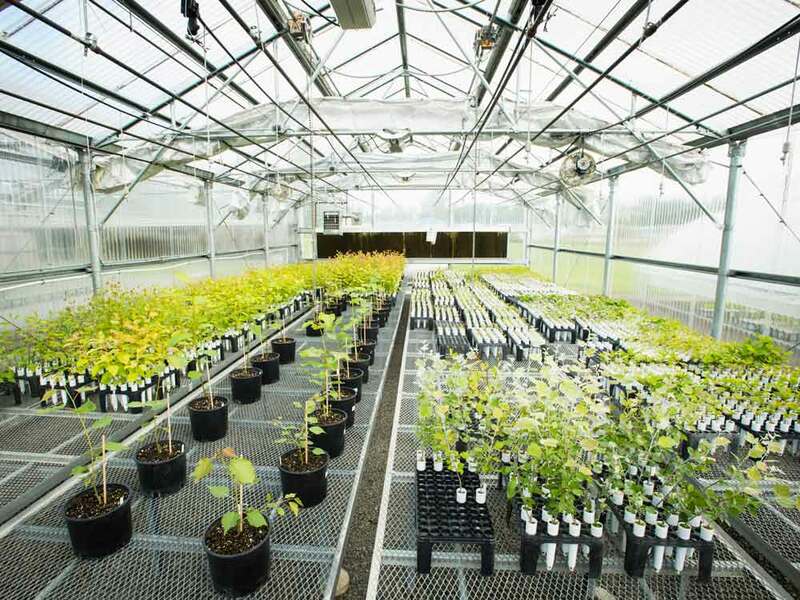 Poplar research developed over the last ten to fifteen years is now being further investigated for breeding and selecting the best hybrid poplars to supply biomass feedstock to Pacific Northwest (PNW) biorefineries. To produce poplar varieties for optimal biomass production, GWR’s research efforts focus on improving specific traits, such as fast growth, coppicing ability, pest resistance, and biomass density. Black cottonwood (Populus trichocarpa) is a species native to the PNW and is the tallest, fastest growing hardwood in the western United States. When black cottonwood is hybridized with eastern cottonwood (Populus deltoides), the fastest growing tree in the eastern United States, poplar growers expect to see enhanced traits such as increased growth. Coppicing, or the ability of the plant to regrow from its cut stump, is another key trait that breeders look for. The economic viability of poplar as a feedstock for biofuel production depends on coppicing because it allows for multiple harvests over several years before replanting, precluding costly site preparation between harvests. Two important features of poplar make breeding easier for researchers. The first is the ability of poplar to produce offspring from two different species of the same genus, known as interspecific hybridization. For example, black cottonwood and eastern cottonwood are two separate species within the poplar genus. Crossing these species creates a hybrid poplar that displays traits of both species. Typically when two poplar species are crossed, their offspring are superior to both of their parents. The second important feature is the ease of poplar species to propagate from cuttings taken from previously established trees, or vegetative multiplication. Poplar breeders use vegetative multiplication techniques to quickly create replicates of trees with the desired traits. The new trees produced from the cuttings are clones of the parent tree, genetically identical copies featuring the traits and characteristics preferred by the breeder. GWR’s hybrid poplar varieties are developed through controlled reproduction. The process starts by collecting flowering branches from male and female poplar trees. 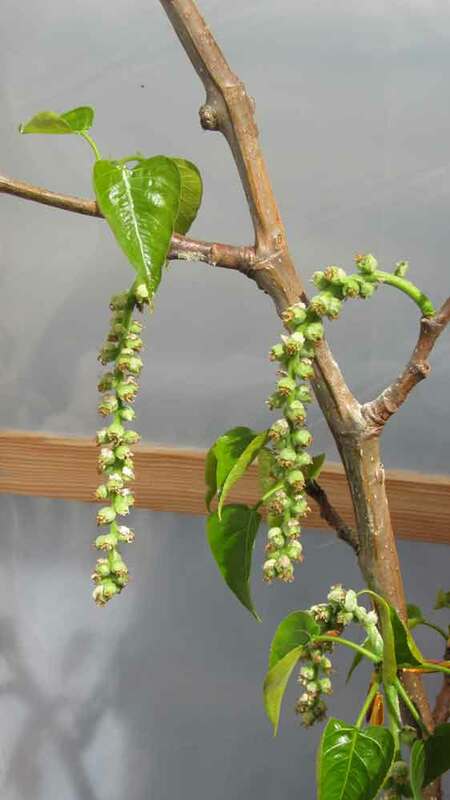 The branches are isolated in a greenhouse where the tree’s male catkins – comprising many flowers – are forced to mature so pollen can be collected. Poplars are hand pollinated in a greenhouse to produce the hybrids. The female catkins of a poplar tree produce seeds after hand pollination. The female branches are rooted in soil or maintained in water. When the female catkins are receptive, the flowers are artificially pollinated with the pollen taken from the catkins of the tree with the desired traits. Once the seeds mature, they are sowed to initiate the testing process in the greenhouse. After the first growing season, cuttings are collected from each seedling to create clones, which are planted to establish field trials that mimic commercial growing conditions. After two to three years of growth and often after coppicing, the clones are measured for the sought after traits and the best performing ones are selected for commercial development. Hybrid poplar seedlings grow for one year in the greenhouse. Twenty-seven unique poplar clones are represented at four demonstration sites across the PNW for the AHB project. The clones are a result of careful breeding efforts by GWR where clones with the desired traits were selected to thrive in the diverse conditions at each demonstration site. During the summer, the AHB project hosts field tours at each of the demonstration sites. At the field tours you can learn about the diverse clones GWR uses to demonstrate feedstock production for a PNW biofuel industry. More information is available on the AHB website at http://hardwoodbiofuels.org/events/.